The Nyingma school of Tibetan Buddhism traces its origin to the Indian adept, Guru Padmasambhava, who came to Tibet in 817 C.E. at the invitation of King Trisong Deutsan (742-797) in order to subdue the evil forces then impeding the spread of Buddhism. Guru Rinpochey, as he is popularly known, bound all evil spirits by oath and transformed them into forces compatible with the spread of Buddhism. In collaboration with the great Bodhisattva Abbott Shantarakshita, Guru Rinpochey then built Samyey monastery, which became a principal centre of learning and the site where many of the texts that would make up Tibet’s vast Buddhist literature were first translated into Tibetan. Guru Rinpochey also gave widespread teachings from the highest classes of tantra and in particular to his twenty five principal disciples. These first Tibetan adepts are reknowned for their spiritual accomplishments, for example: Namkhe Nyingpo for his feat of traveling on beams of light, Khandro Yeshe Tsogyal for reviving the dead, Vairochana for his intuition, Nanam Yeshe for soaring in the sky, Kawa Peltseg for reading others’ thoughts and Jnana Kumara for his miraculous powers. Contemporary Indian masters Vimalamitra, Buddhaguhya, Shantipa and the tantric adept, Dharmakirti, also came to Tibet to spread tantric teachings. So although the study of logic and Buddhist philosophy was not yet prevalent, the practice of tantra in extreme secrecy was much favored. Even the work of translating such esoteric texts as Kun-byed rg yal-po, mDo-dongs-‘dus and the Mahamaya cycle of teachings by Vairochana, Nyag Jnana Kumara, Nubchen Sangye Yeshe and others, was carried out in great secrecy. Seeing the disciples unripe and the time inappropriate for many of the other teachings he had to reveal, Guru Padmasambhava hid hundreds of Treasures in the forms of scriptures, images and ritual practices, with instructions for their revelations for the benefit of future generations. Subsequently, more than one hundred masters have revealed these Treasures and taught them to their disciples. 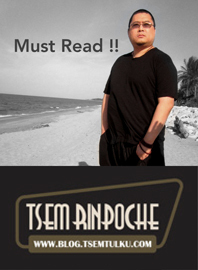 So, besides the tantric teachings, it is these lineages of revealed teachings combined with the Great Completion or Dzogchen doctrine taught and disseminated successively by Garab Doyjer, Shri Simha, Guru Rinpochey, Jnana Sutra, Vimala Mitra, which are distinguished in Tibet as Nyingma doctrine. The Three Common Vehicles comprising the Hearer, Solitary Realizer, and Bodhisattva vehicles dealing with those categories of teachings included in the sutras taught by Buddha Shakyamuni. The Three Outer Tantras consisting of Kriya Tantra which places greater emphasis on practising proper external behaviour, physical and verbal conduct aimed at purification and simple visualization practice; Upa Tantra which lays more emphasis on developing both external and internal faculties with the goal of achieving a deeper affinity with the meditational deity; and Yoga Tantra, which is mainly aimed at developing the strength of inner psychophysical vitality as taught by Vajrasattva. Finally, the Three Innermost Tantras comprising Mahayoga, primarily emphasizing the Generation Stage practice in which the ordinary level of perception and attachment are eliminated through sacred vision and divine pride; the Annuyoga, emphasising Completion Stage practice in which the vajra body is used as a serviceable means to actualise primordial awareness and the Atiyoga, in which all emphasis is directed towards full activation of the generation and completion stages practices, enabling the yogi to transcend all ordinary time, activity and experience as taught by Samantabhadra Buddha. The first six of these nine vehicles are common to all schools of Tibetan Buddhism, whereas the last three, the Innermost Tantras, are exclusive to the Nyingma tradition. The most vigorous revival of Buddhism, however was taking place in Western Tibet where Lha Lama Yeshe O, following the ways of the early religious kings had dispatched intelligent young Tibetans to Kashmir, then a thriving centre of Buddhist learning. The great translator, Rinchen Zangpo (958-1055) and his colleague Legpai Sherab successfully returned to Tibet and spread the doctrine through translation, teaching and establishing monasteries. Lha Lama Yeshe O’s persistence and sacrifice also created the conditions for inviting the great Indian master Atisha to Tibet. He revived the doctrine and dispelled many misconceptions about it then current. He composed the famous text, A Lamp on the Path to Enlightenment which set the pattern for all the graded path, Lamrim, texts found in the Tibetan Buddhist tradition. Among Atisha’s many disciples, Drom Tonpa, who later consolidated Atisha’s teachings and founded the Kadampa tradition, was the most famous. During this period, Tibet’s contact with the India Buddhist tradition was restored, and the influence of different masters led to a diversity of teaching lineages. Gradually three new major new orders, Sakya, Kagyu and Gelug arose. Nyingma was identified as the form of Buddhism introduced since Guru Padmasambhava’s arrival in Tibet. These are the four great schools of Tibetan Buddhism that have survived to this day. Due to the slightly different approaches of various lineages in presenting Dzogchen, three sub-schools have developed: The Mind School (Semd-sde) is attributed to Shrismha and Vairochana’s lineage, the Centredness School (kLong-sde) is attributed to Longde Dorje Zampa, and Shrisimha and Vairochana’s lineage, whereas the Quintessential Instruction school (Man-ngag-sae) is attributed directly to Guru Padmasambhava’s lineage of the Heart’s Drop (sNying-thig) cycle of teachings and practice. Although Dzogchen is the unique feature of Nyingma practice, even among the lay followers the practice of reciting Guru Rinpoche’s prayers, observing the 10th and 25th of every lunar month as a day for feast offerings, and even retiring into retreat for three years and three months individually or in company are common. According to the history of the origin of tantras there are three lineages: The Lineage of Buddha’s Intention, which refers to the teachings of the Truth Body from the primordial Buddha Samantabhdara, who is said to have taught tantras to an assembly of completely enlightened beings emanated from the Truth Body itself. Therefore, this level of teaching is considered as being completely beyond the reach of ordinary beings. The Lineage of the Knowledge holders corresponds to the teachings of the Enjoyment Body originating from Vajrasattva and Vajrapani, whose human lineage begins with Garab Dorje of Ogyan Dakini land. From him the lineage passed to Manjushrimitra Shrisimha and then to Guru Rinpochey, Jnanasutra Vimalamitra and Vairochana who disseminated it in Tibet. Lastly, the Human Whispered Lineage corresponds to the teachings of the Emanation Body, originating from the Five Buddha Families. They were passed on to Shrisimha, who transmitted them to Guru Rinpochey, who in giving them to Vimalamitra started the lineage which has continued in Tibet until the present day. This last mode of transmission is most commonly employed for ordinary people. However, the former two lineages may still exist amongst the highly realised Dzogchen masters. There is yet another tradition which enumerates six lineages for the origin of the tantras by adding: the Commissioned Instruction Lineage (bK’a-babs lung-bstan-gyi-brgyud-pa), the Treasure Doctrine Lineage of the Fortunate Ones (Las-‘phro) and the Lineage of Trustees Established Through Prayers (sMon-lam gtad-rgya’ibgyud-pa). 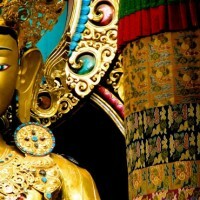 The Nyingma tantric literature and its transmission is classified into three groups: the Oral, Treasures, and Visions. The three may be further subsumed under two categories: the Oral comprising primarily the tantras and associated texts belonging to the cycle of Mahayoga tantras: the root and explanatory tantra belonging to the cycle of Annuyoga tantras: and finally, the Atiyoga or Dzogchen cycle of tantras. The Treasure transmission comprises the innumerable treasure texts revealed by subsequent Treasure Masters, which were hidden by Guru Rinpochey himself in the 9th century as well as numerous teachings later revealed through enlightened minds and meditative visions of Nyingma masters. Hundreds of masters have appeared who have revealed treasures. Among them, Nyanral Nyima Ozer (1124-92), Guru Chowang (1212-70), Dorje Lingpa (1346-1405), Padma Lingpa (b.1405) and Jamyang Khyentse (1820-1892) are renowned as the Five Kings of the Treasure Masters. Their revealed treasures concern, among others, the cycle of teachings and meditations related to Avalokiteshvara, Guru Rinpochey’s sadhanas, the Dzogchen teachings, the Ka-gyey cycle of teachings, the Vajrakila or Phurba cycle of teachings, medicine and prophecies. Hence, in addition to the standard Mahayana Buddhist canon of the Kangyur and Tangyur, many teachings may be found in the Collection of a Hundred Thousand Nyingma Tantras, complied in thirteenth century by Terton Ratna Lingpa (1403-1473) and organised by Kunkhyen Longchen Ramjampa (1308-1363). Besides this, numerous works such as the sixty volumes of the Rinchen Terdzod compiled by Kongtrul Yinten Gyatso (1813-1899) and the writings of Rongzom, Dodrupchen, Paltrul, Mipham and many others have added to the rich collection of Nyingma literature. The oldest Nyingma institution is Samyey temple completed in 810 C.E. by Shantarakshita and Guru Padmasambhava under the patronage of King Trisong Deutsan. Subsequently, no big monasteries were built until the 12th century, when Nechung Monastery was built in central Tibet by Chokpa Jangchub Palden and Kathok Monastery was founded in Kham by Ka Dampa Desheg (1112-92) in 1159. This is an indication that unlike the other Buddhist traditions the Nyingmapas did not become institutionalised until much later in their history. From the 15th century onwards, great monastic universities were built, such as Mindroling, founded in 1676 by Rigzin Terdag Lingpa, otherwise known as Minling Terchen Gyurmed Dorje (1646-1714) and Dorje Drag founded in 1659 by Rigzin Ngagi Wangpo in central Tibet; and Palyul established by Rigzin Kunsang Sherab in 1665, Dzogchen built by Dzogchen Pema Rigzin in 1685 and Zhechen Rabjampa in 1735, all in Kham province. Dorupchen and Darthang monasteries were established in Amdo.